In General Comments (link at top of this page) one pro-white pointed out that one attack consisted of what pro-whites on SF are always saying: It’s too late to save the white race. The commentator was too wise to fall into that trap. This “too late” business is a prophet only tactic they have against the Mantra: getting off the subject. Look at the Mantra. What is says is that white genocide is a legitimate topic of discussion on what is a legitimate subject of concern to white people. The Mantra points out that this would be a natural topic of concern for BLACK people under the same conditions. Like amateurs in Stormfront, anti-whites want to go straight into the hopelessness of it all, which shows why the SFers are amateurs: They make the anti-whites’ points FOR them. Kicking into your own goal is a great way to lose. The answer to this is, as I say, IN the Mantra. This is a legitimate concern of white people. What is the first thing an intelligent human being does when faced with a legitimate problem? Anti-whites use this “hopeless” business to SUPPRESS any DISCUSSION of a legitimate problem. 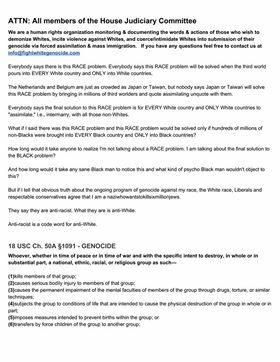 We refuse to get into solutions — like the Final Solution to the White Problem they are pushing under the euphemism “race” problem — until we are allowed to DISCUSS our legitimate concern. Right now we are saying we should not be called racists to gag us from talking about white genocide. This is not just immigration and “being overwhelmed by numbers,” it is the fact that any time someone presses intermarriage as a “solution” he has in mind that one of the partners is white. “Assimilation” is being pressed as a Final Solution to the WHITE Problem, not the “race” problem. Keep YOUR objective in mind. Those who attack us are NEVER doing it to DISCUSS white genocide, they are ALWAYS demanding that all discussion of it be SUPPRESSED. Our goal now is to argue that we have a right to discuss this without being yelled at or arrested. We deserve the same public forum freedom of speech allows anyone. It is the thugs attacking and screaming down our spokesmen that freedom of speech is designed to stop. Bugsers, here we have a new talking point that has just been quoted in the Washington Post and during a Judiciary Hearing. It was picked up from the YouTube chat during the Judiciary Hearing by Jeff’s comment as Fight White Genocide. I would like to have a discussion on the effectiveness of this new meme…have other bugsers used this meme before? Bob would expect us as bugsers to have a discussion on this. How do we attack this term “hate” in the most effective way? Some have questioned that this new meme is hard to understand.. Some other optons may be…. You say you’re “anti-hate” but all you are is anti-white. Any disagreement you call hate. Anti-hate is a code word for anti-white. Jeff said today “Hate speech is any speech you hate”. I don’t judge a country on whether a “far-right” party gets 6% or 9% of the vote, or how draconian their censorship is or even their racial demographics. I judge a country on how demoralized the white population of that country is. More specifically, I judge it on where it is in the demoralization curve. The demoralization curve is a hypothetical model of how the effects of subversion and counter subversion will change the overall level of demoralization of a given white population over time. It is hypothetical because we haven’t seen any white population make it yet to the right side of the curve. A curve can be drawn for a region, a country or the world as a whole. Remember, to be demoralized means you have been put into a psychological state where you can’t come to any reasonable conclusions in the interest of defending yourself, your family, your country, your race. The demoralization curve resembles a bell curve. It starts out low, reaches a peak, and then falls. This is how I think things will play out as our counter-propaganda takes hold and we take propaganda superiority. You can see by this curve there are two ways a population can be in low state of demoralization: because you are on the RIGHT side of the curve or because you are on the LEFT side of the curve. You are on the left side of the curve if you haven’t been subjected ***YET*** to a large amount of anti-white propaganda. This is the case in Eastern Europe now. It was the case in the rest of the white world 60 or so years ago. I bring this up because some people think whites in Eastern Europe have some cultural traits or magic ability to resist anti-whitism. Such people may think we can just adopt whatever it is that gives them this resistance and not have to fight the propaganda war. I say the reason they they are in a low state of demoralization is because they haven’t been subjected to anything like the anti-white programming Anglosphere and Western Europe have been subjected to. As soon as they are, their level of demoralization will rise unless counter-propaganda is deployed immediately. No action or combinations of actions will substitute for winning the propaganda war and taking power. This curve follows the model of epidemic disease. You can have a low state of disease occurrence either because you haven’t been exposed to it yet (left side of the curve) or because you have developed anti-bodies and genetic resistance to the disease (right side of the curve). If you were to examine an isolated population and you observed that they had no incidence of an infectious disease, and they had never been exposed to that disease, would you conclude that they had some immunity to that disease that you would want to study? In fact, if someone said they did want to study that population to determine why they don’t have the disease would you even regard that person as SANE? We can wish that the anti-white mind virus had never been released into white populations. But wishing won’t save white people. We have to develop and culturally embed the terms, talking points and narratives that constitute resistance to virulent anti-whitism. This is a process we’re going to have to go through. Our goal is to get to the right side of the curve. When we do, we’ll be stronger than ever.